Posted on 30th November 2011 by Jules. I can confirm that I am firmly in denial! Having been presented with a "Chrismas Wish List" by my 7 year old yesterday, I slipped in to panic mode, realising that the big day is only 4 weeks away!! I haven't done a thing, which is not unusual for me; favouring a 'last minute rush' each year! I couldn't decide whether the 'wish list' was incredibly cutesy or really manipulative. After each item, in brackets appeared "only if you have enough money" and then the very last item was "Keep my family happy" in brackets ("the main thing"). Well, needless to say whatever the motivation, mission accomplished! In addition to not doing any Christmas shopping, at the moment of speaking we don't have a kitchen to cook Christmas lunch in! Christmas is traditionally a time when people try and get projects completed, so that the fruits of their labour can be enjoyed at leisure over the festive season; hopefully our kitchen will be one of these projects! At Controliss Blinds we are extremely busy keeping up with Christmas demand for our motorised blinds; our order books are high for both 240V electric blinds and battery powered blinds. We have some exciting new fabrics ready to come online in the next few weeks, and as the 'In- house designer" at Controliss, I have had the delightful task of putting the collections together. We have some fantastic, inspirational contemporary fabrics alongside superb, opulent classics ranges. We have a new designer Visio-lux range, of cosmopolitan screen fabrics (which incidentally I have chosen for my own kitchen! ), these fabrics look incredibly stylish and diffuse the light, providing privacy without blocking the light completely. I can't wait to enjoy the experience of mains powered remote control blinds in my own kitchen. The former stable block has become the kitchen in our barn conversion, so we have a series of windows along one elevation, so the motorised blinds are perfect as we can program them to operate as a complete group, moving up and down simultaneously, at specified times, how impressive? We have chosen some fairly high-tech appliances from Siemens, incorporating s Steam Oven alongside 2 conventional and a microwave. I figured if it is good enough for Kelly Hoppen then it is good enough for us! Adding to the touch control technology of our motorised blinds, is the sleek De Dietrich Downdraft Extractor which rises majestically from the island worksurface at the mere touch of a button! Obviously I shall only be able to impress my guests with my fabulous new blinds if I have an equally impressive kitchen installed, so fingers crossed!! Shhh…. Lutron comes to Controliss! Posted on 22nd November 2011 by Jules. Having established ourselves as market leaders in the supply of motorised blinds, Controliss can now add Lutron approval to our repertoire! Lutron are undeniably the most highly regarded company providing progressive light control solutions for a diverse group of homes and facilities. Lutron have their name firmly established in the home automation market, offering fully integrated systems for light control, blinds and shading to complete home automation. Lutron boast an elite clientele around the world, all of whom, have dramatically benefited from the look, feel, and energy saving effects of Lutron products and systems: Caesars Palace, The Bellagio, Nasa Cape Canaveral, St Paul’s Cathedral and 1 Whitehall Place, to name but a few! We are privileged to announce that Controliss have been awarded a Lutron dealership and we fully intend uphold Lutron's esteemed position in the marketplace. At Controliss, we have always prided ourselves on providing a quality product at an extremely competitive price, with Customer Support that is second to none. It is these attributes that equip us to move up into the realms of Lutron blinds dealership. We will not be relinquishing our established Controliss range of electric blinds, in fact on the contrary! I can let you into a little secret, we are about to add to our inspiring fabric ranges for electric and battery powered roller blinds and launch a completely new designer collection of hand finished Roman blinds. 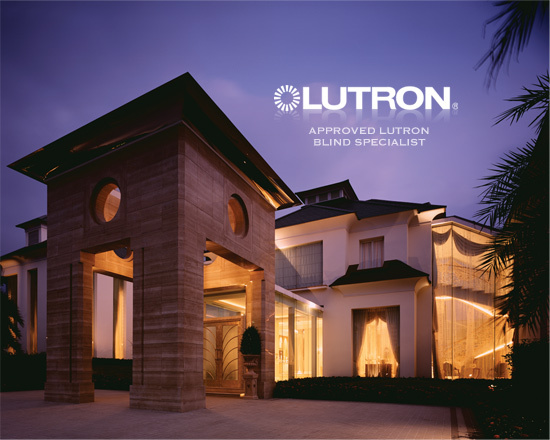 The Lutron dealership broadens our horizons and allows us to promote a thoroughly bespoke service for electrically operated blinds with sophisticated technology. There are so many options available to our Lutron clientele, including roller blinds for skylights, floor to ceiling windows, multi storey windows and complete curtain walls. Curtain tracks over 18 metres long, even curved curtain tracks for the most challenging spaces. All equipped with superior Lutron motor technology and ultra-quiet electronic drives. In addition to the diverse fabric ranges offered by Lutron, there are also bespoke headrail and trim options, in fact almost anything is possible with Lutron! Posted on 14th November 2011 by Andy. The possibility of moving house is so exciting, and creating a home to bring up children or run your business from is a fantastic project. I must admit I can get a bit carried away with design ideas and what I would like in a home. Not only homes but offices could reap the benefits of having a creative room or an area where people can sit, think, plan and create. I would love to be able to design an inspirational room, which would inspire me, allow me to work at my maximum potential and meet with colleagues, so they can work at the same level of creativity. With this in mind, I have started to plan my own brain storming haven. Firstly, the space needs to be well lit, I think natural colours are always good for a base, then you can include bright objects and pieces of art to catch the eye, make you think, let you daydream and ultimately get those creative cogs turning. Something I have wanted for ages is a black board, it sounds a bit old fashioned but I can then write up all the projects that need working on and cross them off when complete. One better than this, as a friend mentioned to me last week, is blackboard paint you can use on the walls, then you can write on them and rub it off! It sounds like a brilliant idea, it’s like creating your own artwork repeatedly. Comfort is up most, you need a good area at which to sit and work, that does not strain your neck or cause any long-term problems, and so ergonomic furniture is perfect. I love to listen to music when I’m working, just in the background, then I feel that I can switch off and tune in at will when working on a project. Plus, when a brilliant song comes on, it really gets your thoughts going. In an office, something interactive is always great to allow people to be creative and engage in a process, so giant games of jenga or Sudoku are a great way to give people a 5 minute break but feel like they’re doing something creative. If you need a room that will act as a stimulus for those creative urges, there is a huge range of inspiring wall prints, original furniture designs, and the devices you need that could help you keep your mind focused. For example, by installing Controliss remote control blinds in place to control the light in the room; without leaving your desk you can open your blinds to brighten the room or close them to a level that makes the light less glaring and create a mood that fuels your imagination. Posted on 11th November 2011 by Chris. Babies and toddlers are notoriously explorative. They like to amble around the house, showing interest in all manner of objects, unaware of what is safe to touch, and what could actually cause them harm. By taking a look around any home, you will inevitably be able to spot areas that could put a child at risk of injury. The home can be a dangerous place for them to exercise their curiosities, but there are many products on the market that can make it less hazardous to your inquisitive youngsters. The first problems to be on the lookout for are objects that are, even if only partly, within reach of a little one, such as a lamp placed on a side table, a radiator or a window blind with low hanging cords, that could fall or have parts that could do some harm to a child. As a solution for each of these given examples, you can obtain electric cable shorteners that will help keep the cables that are required for appliances out of the way to avoid tripping, electric shock or strangulation and may also prevent them falling off their base. Another precaution is to stop a toddler from burning themselves on a hot radiator by purchasing a radiator cover that will not only act as a barrier between the hot surface and the child, it could improve décor by having something aesthetically better than a normal radiator. The Perfect Playthings Radiator Cover from Safetots is a padded fabric cover for water filled radiators that is available in various colours, while Jali can provide made-to-measure covers and cabinets in a style to suit your tastes. In addition, the installation of Controliss cordless motorised Roller blinds would make your home safer for young children. Our wireless remote control blinds have full remote control operation, giving you, not only exceptionally convenient window blind control; but with no need for draw cords, there are no worries about younger children damaging the blinds or, more importantly, hurting themselves. Accidents also occur when larger pieces of furniture topple over which, needless to say, can cause serious injury. A simple way to avoid this happening is to attach furniture straps to the wall and at each end of the back of your furniture where they can be hidden from view. In their inquisitive nature, toddlers will also try to open many doors, cupboards and cabinets. This can be bothersome as, once they are opening doors, they could wander outside, access cupboards containing dangerous objects like cleaning chemicals or glass, or they could hurt their fingers by shutting the door on them. There are many different locks that would present great difficulty to infants trying to gain entry to certain cupboards, cabinets, draws and even a fridge or oven, but are easy to use by adults. And for larger doors, there are door stoppers that will prevent the door from closing on little fingers and can simply be pushed onto the door edge without the need for screws or adhesive. If you are worried about your child opening the front door and wondering outdoors, The Door Guardian is designed to resist forced entry and so is very capable of stopping a child who cannot reach it from opening the door. For anyone who can reach it, the Door Guardian is merely moved aside to allow the door to open. It is suitable for other external doors too, such as a balcony door. A common piece of baby safety equipment is the baby monitor, however these have moved on from being able to just listen to a child in another room, now mums and dads can watch, as well as hear, their baby on a monitor using a camera that is placed in the baby's room, some of which even include a night vision vision mode. The advancement and design of home child safety products give parents many more options, concerning the protection of their child. The result of this is that there is less need for them to be anxious when the toddlers are roaming around the house; playing, discovering and growing. Posted on 8th November 2011 by Chris. Electric blinds are the smart, stylish way to control the amount of natural light coming into your home. With a multitude of exiting design options in fabrics that will stop light getting through entirely, light filtering fabrics that offer good levels of privacy, and our trend setting Visio-Lux diffusion collection that allows a level of vision whilst still giving protection from the sun. Controliss Blinds have an ever-expanding range of products to suit any of these needs, but if you have a wonderful view from your windows or have put a considerable amount of effort into creating a magnificent garden scene, you may regret installing window blinds that stop you enjoying such a sight when not open. Roller blinds fabrics are available that include hi-tech mesh-like designs, semi-transparent patterns and even screens with a solar-reflecting back layer to help keep your home cooler. Having a pleasing view to look at without the harsh glare of the sun can significantly lift your mood when relaxing at home and there are innumerable products that you can obtain to further improve your garden scene.can add notably to the character of your garden are water features. There are many options and styles for these, from the complex but spectacular, to the simple yet charming. 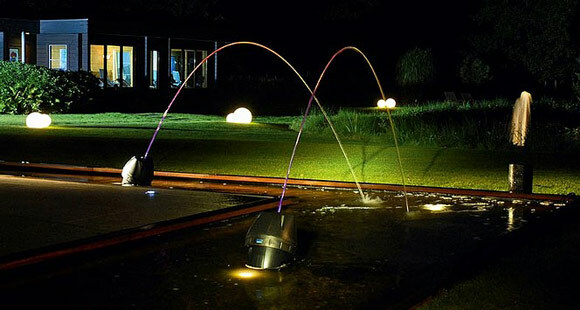 UK Water Features offer a vast range of such products, including the Oase Jumping Jet Rainbow Star and more self-contained models like the Sphere Stainless Steel Water Feature, as well as wire-free solar powered units. They also provide a service in designing and building custom made water features that would be perfect for an utterly unique and enticing garden landscape. The Oase Jumping Jack Rainbow Star can release and illuminate jets of water at adjustable levels to produce arc-shaped streams of water. The light, colours and water patterns are combined to create various pre-programmed displays and sets can be added on to assemble a truly unique water show in your own garden. If you would prefer to add a more self-contained focal point to your garden the popular and modern-looking Sphere Stainless Steel Water Feature is available in sizes ranging from 30cm to 100cm in diameter and the water is lit by LEDs as it is pumped from the top of the sphere. Water features could also be introduced as an indoor decorative accessory. The Smart Solar water features have an optional indoor power adaptor, so they can operate wire-free in the garden or on a balcony through solar power or they can be plugged in and then added as a complement to your interior. While water features are a highly favourable inclusion in a garden landscape plan, they are just as effective at creating a peaceful mood for your business or offices. For instance, imagine entering a restaurant where the décor is opulently adorned, as the daylight dims, plush lighting comes on and your Controliss remote control blinds that superbly compliment such décor, lower themselves automatically. Then, as a focal point for all clientèle, one or more water features are situated in the dining area, delivering soothing sound and a visually captivating display through the simple flow of water. Such an atmosphere is sure create a memorable and blissful experience. Posted on 7th November 2011 by Chris. The capabilities of the World Wide Web could create a seemingly endless list that is constantly being added to with new possibilities for all areas of technology. Now internet is accessible using, not only a desktop PC or laptop, but many more devices; from plug-in and handheld game consoles, to other portable devices including mobile phones, PDAs and tablets. This makes connectivity all the more convenient since it is available at any time, from almost anywhere you would happen to be. This means that, wherever you are, it is possible to read or send emails; media, clothes, or a set of luxurious Controliss electric window blinds are but a few examples of items that you can get delivered to your doorstep, purely through an online customer interface; or you may wish to search for information, or other people's views, regarding a particular subject. For those with very little spare time to sit down in front their computer, mobile internet access can be greatly beneficial in helping to get things done. Another great feature of the World Wide Web for people who struggle to get any spare hours out of the the day, is the online training course. Online training courses allow people to learn about a chosen subject whenever they find time for it, and even gain certifications for that subject, using applications and resources created by or in collaboration with professionals and teachers. One such website that offers the opportunity to develop technical skills through virtual education, whether the intention is to improve commercial productivity or for the simple reason of satisfying personal interest, is Bedrock Learning. If you have a great interest in digitalising your home to enable you to gain greater control over electronics such as your lighting, entertainment systems, window blinds, etc., Bedrock Learning's online courses can provide you with the fundamentals. From their course packages, you can learn a lot more about the capabilities of digital home control and how to get interaction between your devices. The courses vary in price, but all have an optional detailed course guide, they are accessible at any time of the day and if the training is being given to numerous staff members, a Web-based Learning Management System can be used by company administrators to control and track each user's progress on the course. With the ever-reducing number of limitations of the World Wide Web, companies - including Controliss Blinds - can endeavour to improve the range and quality of the services that they are able to deliver, and maximise convenience for their customers. Posted on 1st November 2011 by Chris. The BBC's Breakfast show today highlighted the tragic case of toddler Emily Warner. The two year old who was found by her father, unconscious and hanging in blinds cords in her bedroom at the families home in Royston, Hertfordshire. Emily's mother appeared on BBC's Breakfast show with a RoSPA representative and highlighted RoSPA's hugely important 'Blind Cord Safety Campaign' which is calling upon UK window blinds retailers and manufacturers to take the incentive and manufacture, distribute and retail blinds to the general public without the looped cords that can cause harm and sometimes fatal injury to children through accidental strangulation.